I AM unsure about the title, douleur can be translated as pain, but it also implies grief, soreness, aching, distress and misery as in a heartbreak or a long suffering illness or predicament. It is imbued with a romantic fatalism of the kind that affects most of the older protoganists here. I might have preferred a title like The Pact or the Assassin’s Accomplice. It is ‘60s rural France. There is a background appearance of the crooner Jean Ferrat, the alcoholic mother Anais’s favourite, snatched shopping in the market…in fact he was mayor of Atraigues sur Volane which is 12 miles north of Vals-des Bains which does indeed have (six) thermal springs and a casino and a central hotel Grand Hotel de Lyon and a restaurant Chez Mireille where Simon invites young Bertrand to supper of daube de bouef which it still serves. All this detailed warm realism allows the characters to ascend confidently into rich fantastical expressions of their innermost selves: The ageing gunslinger, the lost boy, the rich widow, the orphan girl and Anais herself who has one of those great moments which might be described as an alcoholic’s worst nightmare. Another woman later is described as having hair like macaroni. Simon says he is a pest controller and needs a driver for a job because he is not well enough to drive himself. Bernard is at a loose end having lost two fingers in a factory accident when he was drunk. Quick passages of description fold into a plot that erupts in progressive surreal realisations of dashed hopes and new ambitions. Like Anais and Simon the town is reaching the end of its livelihood. “Tourists wandered aimlessly as if roaming the ruins of a lost civilisation”. The axis is the handing over of generations bound up into a crime noire. Masculine, macabre, black humour at its best. Well known in France as a novelist with more than 60 titles to his name, Garnier is often compared to George Simenon, but with wit. He died in 2010. 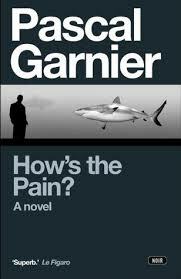 This entry was posted in 101greatreads, fiction and tagged crime noire, pascal garnier, vals-des-bains. Bookmark the permalink.